Load Banks Direct strives to be your complete solutions provider for superior quality load bank products at competitive prices. LBD is one of the premier load bank suppliers based in the USA. Leveraging 20 years of manufacturing excellence, LBD’s products have all of the features and refinements you have been looking for. LBD is the best choice for your Load Banks needs. Superior customer service, second to none! Our Load Banks are typically used for high power load testing of emergency power systems including generators, uninterruptible power supplies, turbines, battery systems and regenerative power absorption of large motors and other load applications. Our load bank products include power capacities ranging from 20 kilowatts to 3000 kilowatts with standard load step resolution of 10 kW – more than twice as good as the industry standard 25 kW. 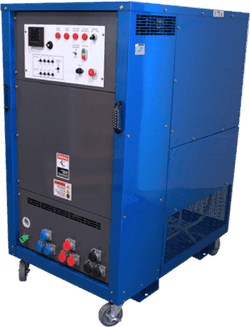 LBD load banks are suitable for use on all common 50 and 60 hertz AC power systems up to 600 volts. Custom ratings, DC models, or medium-voltage designs are also available. We now offer many popular load bank models IN STOCK vs. the typical 2-3 month lead-times offered from our competitors. Request a quote today!